As March marks ‘OVARIAN CANCER AWARENESS’ MONTH it brings about the focus to think about why 3 of Envy’s team member’s have signed up to CYCLE THAILAND IN 2020, raising money for Womenvcancer which supports three women’s cancer charities. Ovarian Cancer action. Breast Cancer Care and Jo’s Cervical Trust. Being that is is ‘Ovarian Cancer Awareness’ month the link to the charity can be found here. This Thailand trio made up of Zayli Gunningham (salon assistant) Tracie Gunningham (salon owner) and Lynda Penny (salon manager) have signed up to cycle 413 km from Bangkok to Ko Samui in October 2020. In this picture one person has had Ovarian Cancer Stage 4 but thankfully has been 4 and half years clear, one person has had pre cancerous cells of the cervix and the youngest one has had relatives on both sides who has had a ‘women’s’ cancer. It’s of no surprise that the recent family and friend losses, inspired each one of the girls to sign up, to raise much needed money to help fund research and also support women and their families that have the disease. The statistics of ovarian cancer are scarily high. The Thailand Trio are hosting a series of fund raising events over the next coming months. 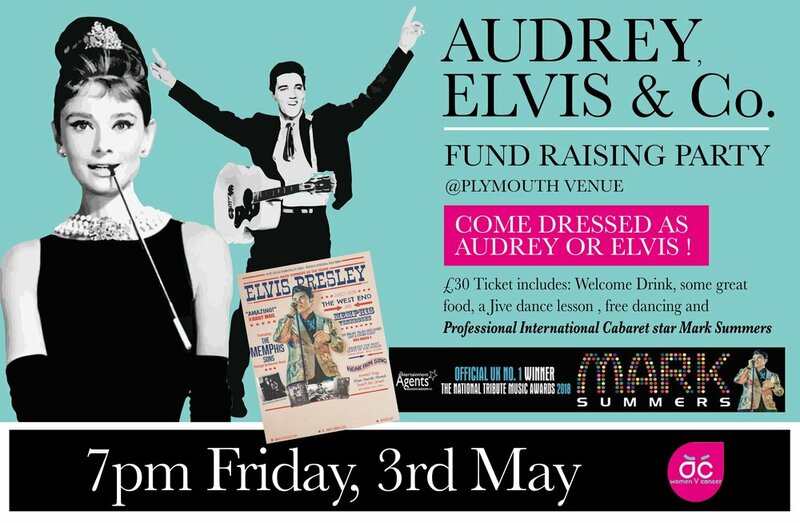 The first big event is an ‘Audrey and Elvis’ themed party. Think ‘Breakfast at Tiffany’s meets Viva Las Vegas’. Entry, a welcome drink, an American themed buffet, entertainment from the AMAZING Mark Summers the UKs Official Number One Elvis Tribute, winner of the National Tribute Music Awards 2018, Kevan Kennedy from the Lemonfrog Dance Company, will be delivering a ‘basic’ jive dance lesson, to set the mood for the rest of the evening. It will be a fantastic evening and a great way to raise money for the charity. All profit will be donated. To read about the teams individual reasons for signing up, take a look at their just giving pages. HELP TRACIE MAKE A DIFFERENCE. We all know someone who is battling cancer. Research and advances in medical science are needed so that we can try and be rid of some cancers. Tracie currently has 3 close friends undergoing treatment for aggressive types of cancer. Tracie said 'When you witness the diagnosis, followed by 'treatment' and 'fight' you realise how lucky you are if you have your own 'health'. We all know that cancer can strike anyone of us at any time. Tracie lost her favourite aunty to cancer last year. She had battled it for years, her strength, determination and the fight, that she showed to battle the disease and stay 'head of the family' ensuring that she was with her loved ones as long as she could be, is something I will never forget. She was INCREDIBLE!! Tracie is hoping that by remembering her aunty's strength that she showed whilst battling cancer, will help her complete the 400km bike challenge in India, 30 degree heat. Tracie will be cycling, in her aunty's memory. Tracie is looking for sponsorship and donations. Her fund raising is well underway however she needs your help to help her reach target. She is currently raffling a weekend for two at THE SCARLET hotel, she also has a beautiful bespoke handmade stained glass bicycle that she is auctioning through ebay. Tracie is looking for CORPORATE SPONSORSHIP too. So if you are a business who would like to put their company logo on Tracie's training kit then please get in touch. Every training ride is published on 3 social media platforms. Tracie is looking for a £50 donation per logo. Please contact Tracie@envymyhair.co.uk if this is something you can help with. Take a look at Tracie's training journey so far. Here are the links to Tracie's just giving page. Women V Cancer is a series of women-only cycle challenges in aid of three British charities – Breast Cancer Care, (RCN: 1017658), Jo’s Cervical Cancer Trust (RCN: 113354/SCO41236) and Ovarian Cancer Action (RCN: 1109743) – raising vital funds to fight breast, cervical and ovarian cancers. The donations you make to Women V Cancer will be distributed equally between them. The Cycle Challenges are organised and managed by Action for Charity – www.actionforcharity.co.uk Women V Cancer is established under the Charities Aid Foundation (CAF), a charitable trust registered with the Charity Commission for England and Wales under number 268369. The funds raised here are restricted to use for the Women V Cancer purpose and will not be used by CAF for any other purpose or as part of CAF’s general unrestricted funds. Tracie started her dance journey on the 24th of February 2017, after being volunteered by Shelley Coleman, to perform a ‘strictly style’ dance routine in front of 300 people for Plymouth Ladies Club Charity. Her partner was the owner of the Lemon Frog Dance Company, Kevan Kennedy. Her first lesson was an initial assessment, to see whether she had any natural dance ability, and more to her horror, to see whether or not, she could be lifted! The first few weeks consisted of working out the routine, timing to the music and the likes and dislikes of certain moves. Tracie soon learnt that even the basic moves were going to be a lot harder to learn than initially thought. To help speed up her learning, she enrolled on group dance lessons at the Lemon Frog, that included Salsa and Tango. Ten weeks on from her first dance lesson, she had lost over a stone in weight and dropped a dress size, due to increased exercise and the thought of performing in front of 300 people. Tracie was really starting to struggle with nerves at this stage too and enlisted the help of a mindfulness coach, Jackie Taylor. Jackie taught Tracie some techniques to help calm her nerves and keep the anxiety under control. Techniques such as meditation, visualisation, mindful pauses and anchoring to name a few. THE BTS VIDEO 'IN TRAINING'. Take a look at Tracie's personal reflection in this short video below. Weekly sessions with Kevan and Jackie, led to a 'runner up' placement at The Plymouth Ladies Charity Club Strictly Come Dancing Ball. Tracie said 'I didn't expect to win, however I achieved my goal, I performed my routine from start to finish, I was composed and confident, I was happy with my performance'. Kevan at The Lemon Frog, choreographed the dance, took Tracie from a non dancer to a dancer. Tracie said 'he’s an amazing teacher and has made the lessons fun and enjoyable, but above all he has been patient and encouraging'. The evening was well attended. Tracie and Kevan received lots of encouragement from family, friends, the ‘Envy Team’, clients and Lemon Frog members who all came along to support the charity. After much consideration, Envy has decided to close its hairdressing salon in Plympton St Maurice and transfer the business to its Broadway branch. Contributing factors were not being able to attract another staff member to join the small team, impacting on Envy’s ‘no lone worker policy’. It had become increasingly more difficult to staff the salon in times of sickness and holiday periods. Tracie Gunningham said: “I’ve seen a big change in the hairdressing industry in the last 5 years. It is becoming more and more difficult to attract ‘GREAT’ stylists. Despite successfully recruiting new team members at our Broadway and Royal William Yard branch, Plympton has been harder to attract staff. It made sense therefore, to transfer Tom (our excellent Manager and hairdresser) to our busier team at the BWY. Tom will now assist Sarah Chapman and Allison Samuels in the management of the Broadway branch. Tracie and Tom would like to whole heartedly thank the local residents for their support and loyalty over the last two years. We would welcome our loyal residents to make the journey to Plymstock and will be offering a loyalty discount for anyone who would like to transfer. As sad as it is to close the salon, it’s not all bad news as the premises will become Envy’s head office. The premises will lend itself to a meeting room for the Envy managers, as well as having design and PR on site as the office space will be shared with two other businesses. The office will be named ENVY HOUSE. Ian Gunningham (Tracie’s husband) will run his brand communication company from the site and Lucy George - Foster will run her PR Marketing and Event from there too. Both Ian and Lucy are well known figures in the Plymouth Business area. ENVY House will become a lively hub of creativity in the Heart of Plympton St Maurice. A cold October morning, Tracie Gunningham & Sarah Chapman set off early hours to fly to the capital to complete their KMS training. The final session to their Style Syndicate course that they started in January. The course focused on the management side of the hairdressing industry and included tips and advice in retailing, consultation process, customer service and measuring performance of employees. Tracie Gunningham said 'that she has fully enjoyed the Style Syndicate and very much looks forward to implementing new ideas that she has gained from the course'. Envy would like to welcome Tiffany Hodge to Envy RWY team. Tiffany can be found at Envy RWY Wednesday 3pm -10pm, Thursday 1pm -8pm, Friday 9am-5pm and Saturday 9am-5pm. Tiffany brings with her a diverse skills set and specialises in cutting, colouring, hair up, wedding hair, pastel and creative hair colouring. Despite our old PSM manager moving on, the Plympton St Maurice salon is still very much OPEN for business. The new manager at ENVY PSM is our very own Tom Pearce. Tom has a loyal clientele and has a wealth of experience. Tom has qualifications in level 2 & level 3 hairdressing, L'Oreal colour, and has completed a number of courses including that of Goldwell and Keune colour. We would also like to introduce our new employee, Amy Grimmer; Amy is now working with Envy part time and offers hair, nails and express beauty services, making her a diverse and brilliant addition to the Envy team and in particular adding extra services to PSM. Why not take advantage of our offer and receive 50% discount off your first visit to the salon. A drop in temperature, must be time for fashion designers around the world to show off their new Autumn/ Winter collection, and that's just what ID Fashion did by holding a fashion show at Mills Bakery, Royal William Yard. With the walk ready, the team from Envy gave up their Sunday to make the models look fabulous. The cat-walk lasted 45 minutes with a raffle in-between, and this was all in aid of a new charity: Plymouth Ladies Charity Club. Plymouth Ladies Charity Club is a recently launched charity, created to provide grants of up to £500 for children and young adults in the PL postcode area. They welcome applications from children, their parents or carers in need of financial assistance, be it to achieve a long held ambition or to overcome a short term problem. The event was a success, with plenty of socialising and the bar laid on by Le Vignoble, one person who enjoyed it in particular was our very own Tracie Gunningham "It was a well attended event, the perfect launch for a new charity and a great time had by all." After ENVY’s hairdressers first pamper session, including a cream tea for clients of Simply Counselling Community Interest Company, the ENVY staff were pleased to welcome back the Simply clients for a second pamper session, this time including a fruit drink and strawberries. Even though Envy were already committed to raising funds for another charity this year. Owner Tracie Gunningham was keen to be involved and give something back to the community. The event was attended by over 30 of Simply’s female clients who very much enjoyed the pamper session and 20% discount vouchers. The Envy team were delighted to welcome the many guests from Simply, encouraging them to enjoy the afternoon pamper event, where ENVY provided a complimentary fruit drink and strawberries. ID Fashion celebrated their 1st birthday in style with a special discount event, location: Royal William Yard. In attendance was Tracie Gunningham accompanied by husband Ian and daughter Zayli. Wine and canapes were a perfect compliment to the ambience ID Fashion created, making it a great experience to check out the latest designs on offer. Tracie was quick to take advantage of the 20% discount on offer that night, and came away with a new bag, & dress. She was also lucky enough to win a necklace in the raffle! Below: Tracie Models new purchases & winnings. Location Holiday Inn Plymouth. Skills Group laid on a competition for young hairdressers to express their skills. Starting with the Novice's group category "at the races". Lauren stepped up to the bar and produced a wonderful piece of hair art. With a pleated part of the back section, the junior stylist then took small sections of hair placed and sprayed to create a rose effect swirl. Hair accessory was made out of hair to create the look of a fascinator and placed and secured to complete the look. But the celebrations didn't stop there. Also flying the Envy flag in the advanced group was Rhianne Cawse. With the category title of "Razor Sharp", the Plymstock based stylist used clippers to cut length 'razor sharp' cut wide blunt fringe and disconnected side pieces to create geometric insterest. Tracie Gunningham was delighted with the result. She said ' it's always great to see what the standard is in the city, today it was high, the girls worked hard to prepare themselves and their models for the competition and their hard work and determination paid off'. The Envy team love a competition and the apprentices are fully supported and encouraged by all senior members.